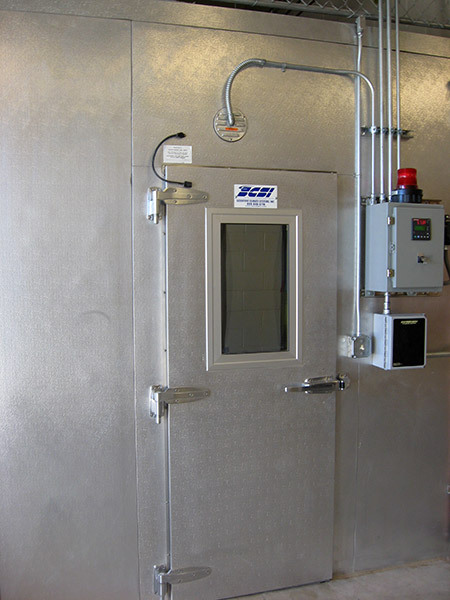 SCS designs and builds Walk-In Explosion Proof Rooms & Chambers that meet Class 1, Division 2 criteria. Explosion proof test chambers are needed for storage of volatile chemicals, flammable liquids & gas substances. These volatile substances are normally contained in storage containers such as 55 gallon drums that will be stored in a controlled temperature Chamber. SCS will provide explosion proofing to all interior components of the chamber including lights, fan coil units, controls, switches, etc to Class I Division 2 criteria. In addition, SCS can explosion-proof any exterior components of the test chamber if it is to be located in an existing Class I Division I explosion proof area. Please contact an SCS representative to find out more information about our Explosion Proof capabilities.